Rangers pay particular attention to the maintenance of firebreaks and endeavour to inspect them all prior to the fire season. Infringement notices will be issued where landowners do not comply with regulations. Owners and occupiers are required to clear and maintain their property during the specified fire danger period, from 1 October to 31 March (please note this date has changed) . Specific details are issued with rates notices or can be obtained from the Shire Administration Building on Windich Street. Residents living in or near bushland are reminded not to rely on public water supplies if they plan to stay and defend their homes during a bushfire. If you plan to stay and defend your home you must have an INDEPENDENT water supply and pumping capability. Scheme water may not be available due to damaged infrastructure, extreme demand depleting supply and pressure, or a cut to power which is used to pump water. We have made our own preparations for the 2017-18 bushfire season by readying equipment and systems to cope with extreme conditions. Despite these efforts, it is likely there will be a reduction in water pressure, and scheme water supply tanks may run empty in the event of fire. 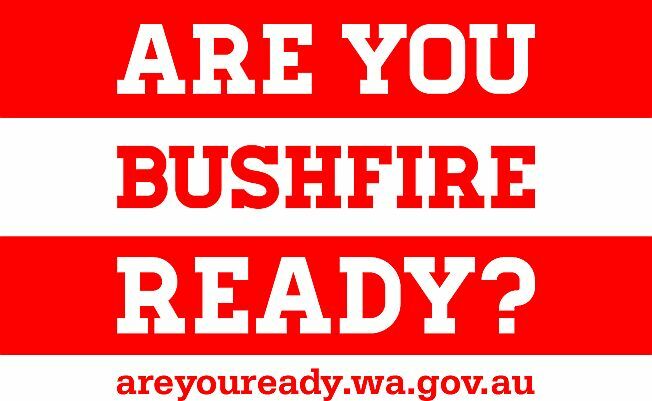 For more information about preparing a bushfire survival plan and what you will need to actively defend your home, visit the Department of Fire and Emergency Services website. The Department of Water has advised people in bushfire prone areas with bores and access to surface water that they can take and store water to support bushfire plans.